Folio 579r of the Codex Atlanticus contains many confusing subjects. 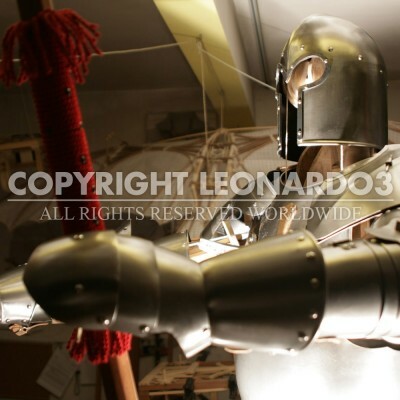 The Leonardo3 research center has brought the several mechanisms on the page to light: pulleys, a drum, a clock-work system, some gears, various mechanisms, a helmet and a coupling for battle armor. By analyzing the details and crossing them with the information and notes hidden in other Leonardo codices, we arrived at the hypothesis of the torso of an artificial soldier that can beat its hands against its chest when the central wheel is set in motion. The same clues show that many other reconstructions of the soldier are mistaken and that this, some 500 years later, is the most detailed study of Leonardo’s robot ever completed. The structure of the android dummy was made in walnut and elm wood for the stress points and maple and oak wood for the filler parts and limb sections. Taking our cue from the anatomical Da Vinci manuscripts, a movable-bone system was created to easily accommodate the armor and modify the position of the bones as though they are real. Spacers were inserted between the structure and the armor to imitate the bulk of the arms so they mold perfectly to the armor. As reference for the armor, we chose one of the well-known Milanese ones Leonardo designed while working at the court of the Sforza family. 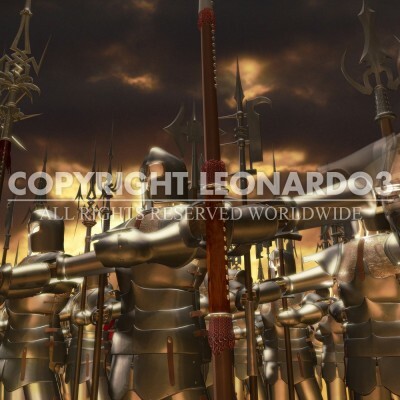 The armor is heavy and the arms are difficult to keep raised because of the tremendous stress placed on the shoulders. In addition to using resistant wood like elm, two halberds were added to the exhibition model in order to stabilize it; these too were reproduced on the basis of Da Vinci drawings (folio 1ar of the Codex Ashburnham). A skeleton with movable joints to be placed between the armor and the pulleys in order to support the structure had to be hypothesized. The artificial joints are equipped with pivots to hold the pulleys drawn on folio 579r. The pulleys and rope cannot be inserted alone inside the armor. Such pieces could be those drawn on folio 1021r of the Codex Atlanticus: an arm, a leg and a movable head. Leonardo didn’t draw any human anatomical parts on folio 579r, perhaps precisely because we’re dealing with the armor for an artificial soldier, or because he left them as implied.